This is the final installment of a 3-part series dedicated to preparing a wide variety of Chinese greens. Click here for parts 1 and 2, and be sure to check out the Diversivore Ingredient Page to learn more about the greens being used in this series. Well, time to go out with a bang. Welcome to part three in this series on “Universal” methods for cooking Chinese greens. For this installment, we’re going all in – one technique, three variations, and all the veggies you can eat. If you missed parts one and two and you’re wondering what this is all about, click here or here to read more. Our third and final technique involves two very easy steps – blanching, and dressing with a sauce. This technique has a lot going for it, though at first glance blanching might seem a little unremarkable. But don’t be misled – this is no over-boiled asparagus or mushy pot of peas. When executed quickly and with attention to the ingredients, this is a technique that promises bright, crisp vegetables, and flavours limited only by your imagination. Blanched and dressed vegetables land somewhere in between braising and stir-frying in terms of flavour; the veggies are soft and tender, while the sauce is intense and relatively concentrated. Regardless, the results are really easy to love. Blanched vegetables are incredibly popular in China, which isn’t surprising because they really only require that you know how to boil water. Despite this, a lot of Chinese restaurants seem to treat blanched vegetables like an easy cop-out, choosing to slop some oyster sauce on and call it a day. Luckily, you only need to put a little more attention into the sauce in order to end up with something absolutely out-of-this-world. I’ve prepared three different green vegetables with three different sauces to demonstrate the versatility of this technique. First up, there’s the ultra-traditional gai lan with oyster sauce. A lot of restaurants take the lazy way out with this dish, pouring straight oyster sauce over a bed of greens. For many, this is their first exposure to this cooking style, and the lackluster results can leave many unimpressed. Despite the name, oyster sauce alone is not enough – the key to success is the garlic, which is fried until golden and fragrant and absolutely spectacular. The second dish is adapted (with pretty minimal modification and a bit of optional trouble-shooting) from Fuchsia Dunlop’s phenomenal book Every Grain of Rice (I highly recommend any of her books). The scalding, sizzling oil certainly adds a bit of drama to the table, but it remains an incredibly easy dish to put together. Her original dish uses yu choy (choy sum), which would be excellent. I’ve decided to use tatsoi (rosette bok choy) here instead, but any number of mild greens would work wonderfully. The third dish is something of a Chinese/Vietnamese fusion dish, which I’ve included to show how you can adapt or invent any number of sauces to go along with blanched greens. The sauce is simply a mix of some of the quintessential Vietnamese pho accompaniments: hoisin sauce, chili sauce, and basil. In this instance, I’ve used vibrant, incredible Taiwanese spinach, but once again any number of leafy greens would work wonderfully. These greens and sauces are not only amazingly delicious, they’re also these are incredibly easy to prepare. How easy? I cooked all three, one after another, and had them all on the table within about 20 minutes. Admittedly, there was a fair bit of cleaning and measuring (not to mention note-taking and photography, the oft-forgotten time-vampires of food blogging), but once you’ve prepped your veggies and mixed your sauces, everything comes together in a snap. So what’s the ultimate trick to good blanched and dressed veggies? Timing. I mentioned in my previous post that this technique is time-sensitive. What I meant is that, like stir-frying, you want to work fast and be well-prepared. If you cook your greens too long, they’ll end up soft and flavourless. If you dress them or let them sit too long before serving, they’ll run together and end up looking a little ‘droopy’ on the plate. You want to move from pot to plate to table in a matter of minutes, if not seconds. But honestly, it’s not difficult to do – in fact I would rank this among the easiest of all cooking methods to master. So there you have it. Three days, three Chinese vegetable cooking methods. These techniques are delicious and amazingly versatile. If you have a leafy green, you can use one or all of these methods. Other vegetables can work well too, especially those that shine brightest when raw or gently cooked (e.g. peppers). I hope you’ve enjoyed this little mini-series, and I hope you’ll keep coming back as I explore more Asian vegetable cooking and soy-based ingredients this month. To make sure you don’t miss updates, Subscribe or follow Diversivore on Twitter, Facebook, or Instagram. Now go eat your veggies. Because this is three recipes in one, I’m going to break this section up based on the individual variations. Try any one, or try them all, and don’t forget that you’re not limited by the greens. You could swap any of the greens and sauces, or use other vegetables not mentioned here – all you need to consider is cooking time. Thicker, woodier veggies need to be blanched longer, while delicate leafy vegetables need to be blanched only briefly. 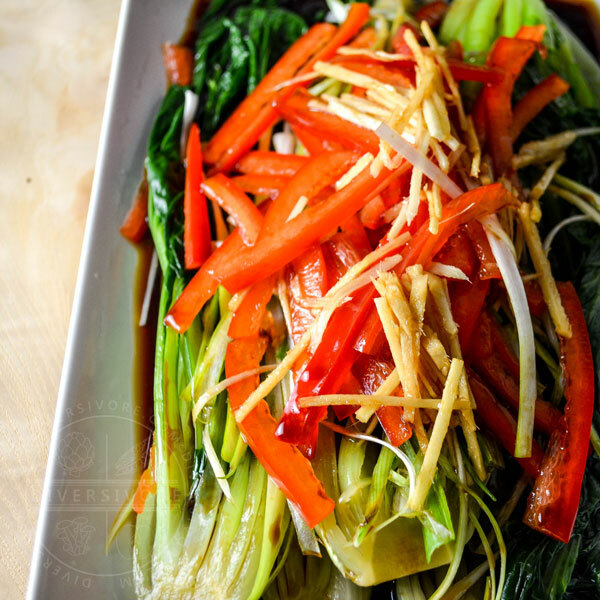 Moderately crisp veggies like bok choy or yu choy will land somewhere in the middle. Regardless of the veggie, you’re looking to end up with a deep, vibrant green leaves and a semi-translucent stems. Don’t forget to add the oil and salt to the water, as they help add flavour to the vegetables and help the sauce cling to the leaves. If you have culinary restrictions, note that the differences between the three recipes. The sizzling oil and ‘pho-style’ sauces are vegan, while the oyster sauce is pescetarian. That being said, excellent vegan oyster sauces are available (these use mushrooms in place of oysters). Gluten-free designations are somewhat confusing when it comes to soy sauces and soy products (some soy sauces are apparently gluten-free despite containing wheat), but the sizzling oil dish can be guaranteed gluten/wheat-free if you use Japanese tamari in place of the soy sauce. Gai lan cooks a little longer than some of the other greens, but it should retain a good crunch and a slightly pungent, mustard flavour. 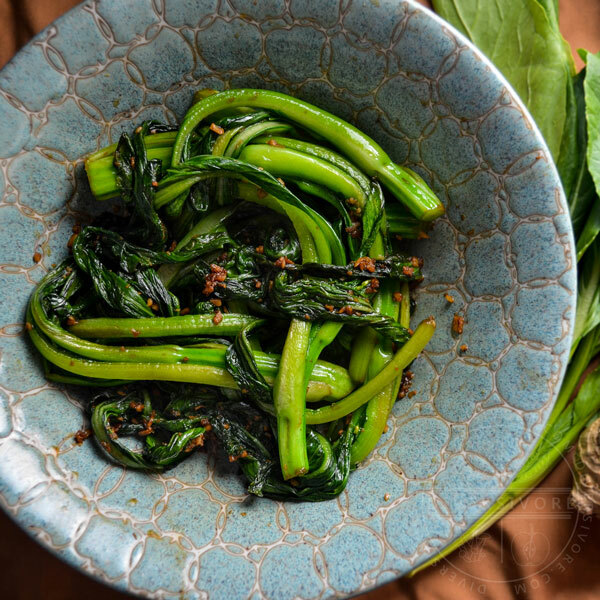 If you can get baby gai lan, it’s ideal for this dish, as it doesn’t require slicing or paring down to size. Make sure to get the oil nice and hot so that the garlic browns evenly. As soon as the garlic is well-cooked, add the oyster sauce and water. It will sizzle and boil as you mix the two ingredient together, but should be removed from heat within about 30 seconds to avoid burning or reducing too far. As mentioned above, the key to this dish is heat. The oil has to be exceptionally hot when you pour it over the vegetables, so don’t be shy (but do be careful). If you’re uncertain about the temperature of your oil, try pouring a very small amount on to the vegetables to make sure it’s hot enough (i.e., sizzling). If you do end up pouring the oil on while it’s too cold the ginger and peppers will remain a little too raw, however this is easily fixed: simply pop the dish in the microwave for 1 minute or so to steam/soften the vegetables. This one is the easiest of the three dishes, and doesn’t really require any special notes. Simply combine the hoisin sauce, sriracha, and hot water and drizzle over the greens. Top with basil and chilies or red peppers, if you like, then serve. Taiwanese spinach is a flavourful, long-stemmed spinach variety that’s worth hunting down. If you can’t find it, regular spinach will work brilliantly, as will any number of leafy green vegetables. 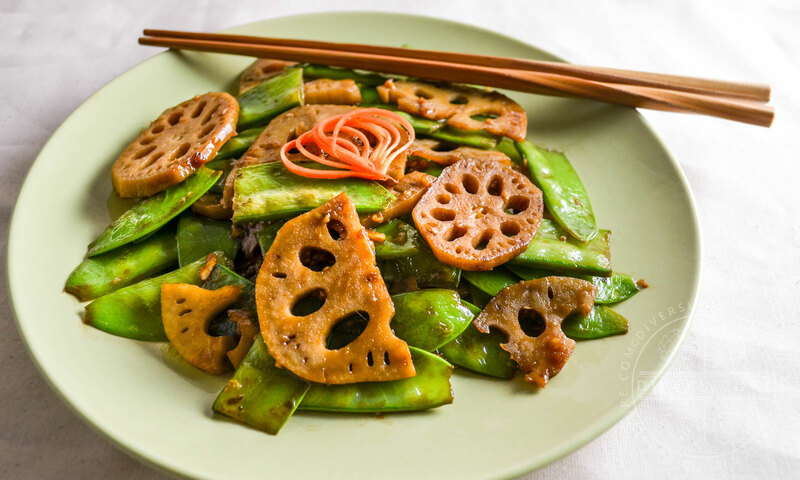 GOOD NEWS:NOTE: The nutritional information shown is for gai lan with oyster sauce. All three of these variations are exceptionally healthy. There is a fair bit of oil and soy sauce (or soy-based sauce), but this is spread out over a lot of vegetables, and a little goes a long way. The vegetables themselves are all exceptionally healthy, and low in calories. Chinese greens can easily be blanched to make flavourful, simple sides. This method is very rewarding, and easy to apply to a wide variety of vegetables. This version features tatsoi (or bok choy) and a simple, universal braising liquid. Wash and the greens and set them aside. If you're using a larger/tougher green like gai lan, you may want to halve the stems to ensure that they cook evenly. If you're using a head-forming vegetable like bok choy, you can halve, quarter, or otherwise divide the head to yield more manageable pieces. If you're using a very leafy green like spinach or amaranth, leave it whole. Bring a large pot of water to a boil. Add the salt and oil, then add the vegetables to the pot. Blanch until cooked but still vibrant green. 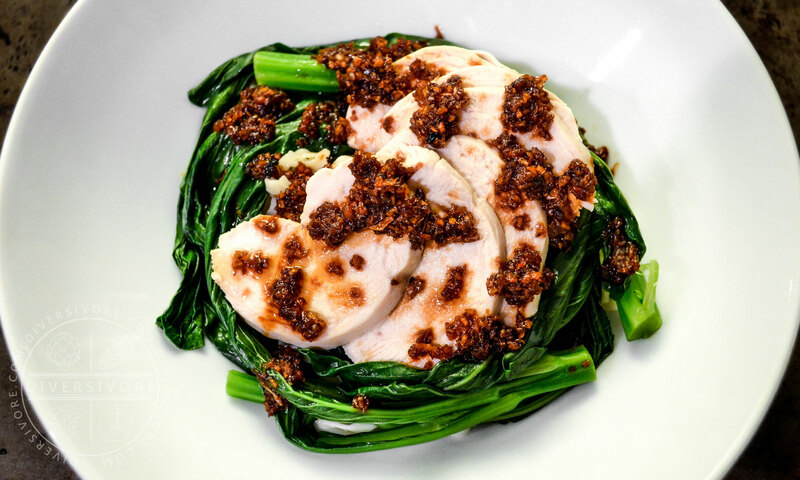 Firm vegetables like gai lan should retain their crunchy texture (about 3-4 minutes), while soft vegetables like spinach should be cooked only long enough for them to wilt and darken (about 1 minute). Drain the greens and douse with cold water to cool them down. Drain the excess water (you may want to gently squeeze leafy greens like spinach), then serve with a sauce. Heat the oil in a wok or frying pan over medium-high heat for about 2 minutes. Once very hot, add the garlic and cook until golden brown and crispy. Add the oyster sauce and water and stir to combine. Spoon over the cooked greens and serve immediately. Once the greens are cooked, top them with the scallions and peppers. Combine the soy sauce and water and set aside. Simply combine the hoisin sauce, sriracha sauce, and hot water. Drizzle over the greens, then sprinkle with basil and chili peppers or red peppers, and serve immediately. Vegetables like gai lan and choy sum don't reduce down too much, however particularly leafy vegetables with thinner stalks will lose a lot of water volume and mass as they cook. If you choose a particularly soft or leafy vegetable, you may want to use closer to one pound (450 g). The only tricky technique here is the sizzling oil. Try pouring a very small amount of oil on to the vegetables to make sure it's hot enough (i.e., sizzling). If you end up pouring the oil on while it's too cold the ginger and peppers will remain a little too raw, however this is easily fixed: simply pop the dish in the microwave for 1 minute or so to steam/soften the vegetables. What a great series of posts. I have loved reading them and the recipes look great. I love the look of that Taiwanese Spinach with pho stage sauce. Next time I am in China Town I will seek out some Taiwanese Spinach. My mother in law made this simple cabbage dish with similar techniques outlined here. She blanched the cabbage, then make an oil drizzle using Szechuan peppercorn. This type of peppercorn has a particular aroma that is super fragrant, and the oil doesn’t turn up too spicy. She tossed the oil in while it’s still warm but it could be eaten at room temperature. Ooh, I love Szechuan peppercorns. I’ll have to give that one a try! Thanks Joyce! SEAN! These all look fantastic. You know, I ~never blanch my veggies. It’s one of those techniques that always seemed frightening to me, for the reasons you’d listed, and now I am super duper anxious to try it. I love making Asian-influenced food–it’s definitely one of my favorites. So this entire series is really inspiring. Maybe if I’m so lucky I can snag you for doing something like this for Killing Thyme some time as a contributor. I love your approach, writing style, and photography. I’d be honored! I’m really glad you’re enjoying the posts Dana! I would absolutely love to do something for Killing Thyme! I love your blog, and I’ve been impressed with the quality of the content time and time again. I’m honoured just to know that you’d like to work together! I had missed the first two posts in this series so I went back and read them–such great tips! I love Chinese greens, and I usually just steam them for a minute in a bamboo basket over simmering water, then drizzle them with soy sauce and sesame oil. But your sauces look amazing! I’d gladly wipe those three plates clean in one sitting. Thanks for giving me new ideas to switch things up! Again, great reading! Not to mention how wonderful all the above dishes look. i am learning so much from your techniques Sean, thank you! It’s only the morning and I just caught my mouth water from reading this and looking at your pictures of deliciously dressed Chinese vegetables!